Keto cheesecake recipe that is no bake and super easy! This keto cheesecake is made in ramekins and serves two. This post is sponsored by Stevia In The Raw®. All opinions are my own. I’m of firm belief that the success of any diet, whether optional or not, is a good plan. It’s the same way with dinner for my family during the week. If I don’t make a plan, we end up having soup and grilled cheese. Yes it’s still delicious, but it does nothing to make a dent in the 10 pounds of frozen meat I have in my freezer. So, if you’re following the keto diet permanently or temporarily, it’s best to arm yourself with ways to handle any dessert cravings that might come your way—especially if you’re focusing on staying on track in the New Year!. Enter my little keto cheesecakes for two in ramekins. They’re so cute, so easy and fast to make! Top them with any fruit that you like; raspberries happen to be my favorite, but strawberries work great, too. 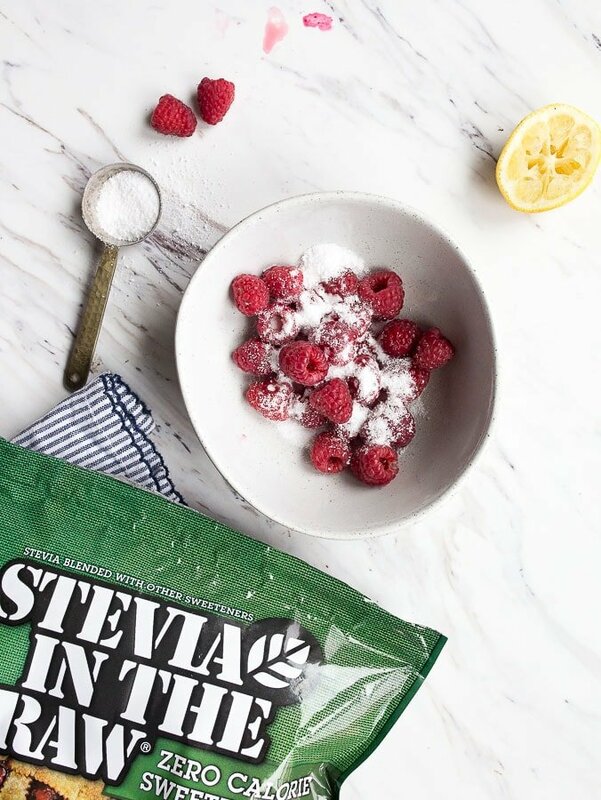 To make any fruit topping for dessert, just chop or smush the fruit in a small bowl while sprinkling a big pinch of Stevia In The Raw on top. Give it a quick stir, and then let it rest for about 5 minutes. 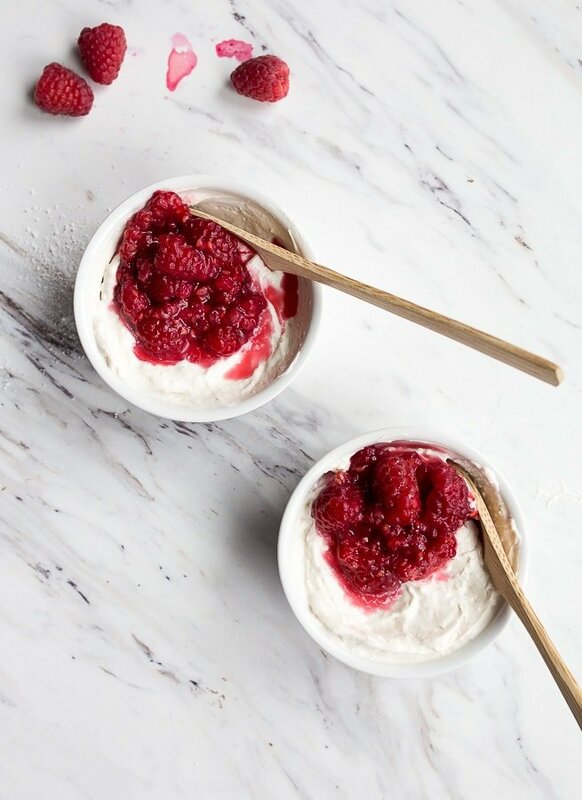 The fruit will break down slightly and collapse into a sweet sauce that goes perfectly on top of a ramekin of keto cheesecake. I based this recipe off of my no bake cheesecake for two from my third cookbook, Sweet and Simple: Dessert for Two. The simplicity of having a cheesecake in a ramekin, no crust even necessary, speaks to me. I make it a lot during the summer months when fruit is at its peak, but you can make it with frozen fruit in the winter months, too. I’ve found that when nothing else will cure a sugar or dessert craving, cheesecake will. Cheesecake is always willing to step up to the plate, and now keto cheesecake for two is here to save the day! 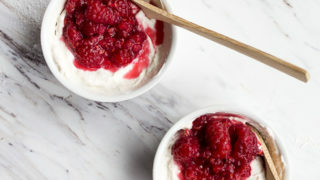 This recipe makes just 2 small ramekins of keto cheesecake, but it is so easy to double or even triple to have more in the fridge. Store them for any cheesecake cravings you might have, or serve them as a creamy dessert at a dinner party. While there are only five ingredients in this keto cheesecake for two, we should really talk about each one. 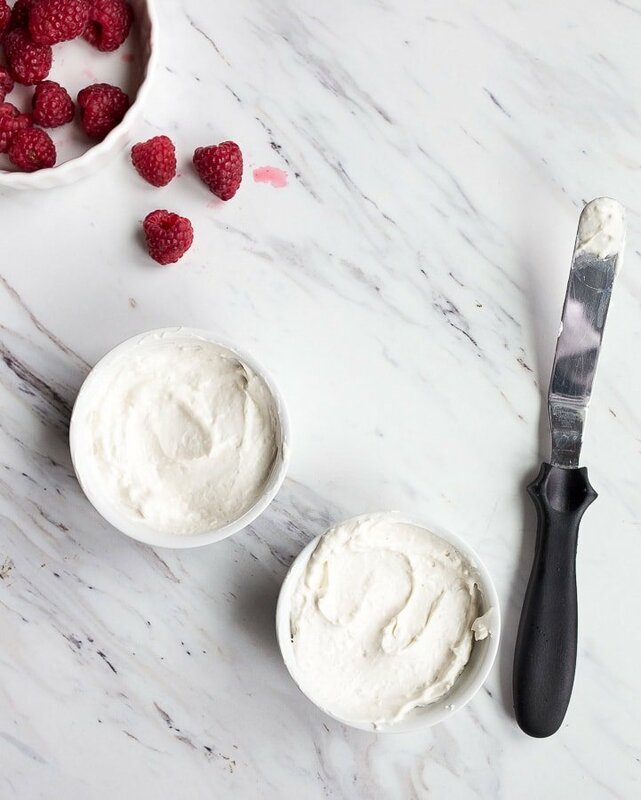 First, the cream cheese—it must be super soft, or it will be lumpy when mixing. I open the package of cream cheese, slice off 4 ounces (half of a brick), and let it rest on the counter at room temperature until it’s very soft. Second, the coconut cream. If you haven’t yet discovered coconut cream as a replacement for heavy whipping cream, you are in for a great surprise. You can now buy cans of nothing but coconut cream (not the same as cream of coconut, which is for cocktails like piña coladas). However, if you can’t find a can of just coconut cream, buy a regular can of full-fat coconut milk. Place either can in the fridge overnight. Open the can, drain off the liquid and you’ll be left with nothing but pure coconut cream. Refrigeration helps with the separation because the cream sinks to the bottom of the can when it is cold. It whips like real whipped cream with a hand mixer. It’s insanely delicious, and I actually prefer it over regular whipping cream. 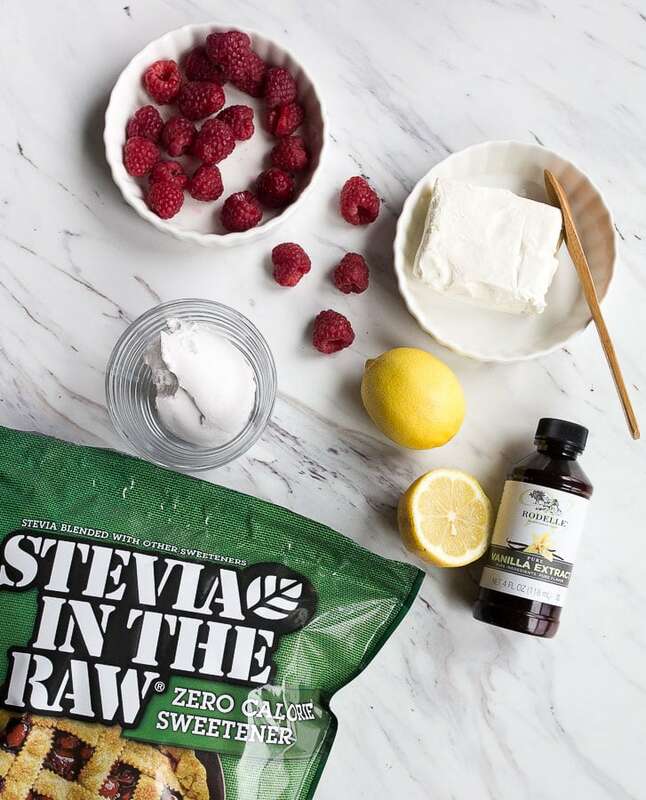 Third, Stevia In The Raw® Bakers Bag. The Baker’s Bag measures cup-for-cup with regular sugar, though you still want to keep half of the sugar if you’re substituting it in a baking recipe to ensure the proper browning, rising and caramelization only regular sugar can provide. If you’re unfamiliar with Stevia In The Raw®, it is a zero-calorie sweetener that contains an extract from the sweet leaves of the stevia plant. Fourth, lemon juice for its tang and classic cheesecake flavor. Fifth, high-quality vanilla extract. It’s the dominant flavor in cheesecake, and something magical and creamsicle-like happens when you mix lemon juice and vanilla extract. I don’t make any cheesecake without it, especially a keto cheesecake. I hope these keto cheesecake ramekins are on your dessert menu this year, either for Christmas or as a must-have in the New Year! For other keto recipes, check out my sugar cookie truffles and my keto sugar cookies. Cuisine: keto	/ Category: HEALTHY! Love this! My husband will love it! Amazingly delicious and easy. I have been ketoing for a little over a month and my cravings for sweets…please tell me that the carb and sugar grams are not for this desert!! Hi Doreen! glad you liked it! I think my nutrition calculator is acting up. These numbers don’t sound right to me either!